Black Cumin Seed Oil has been used for generations as a spice in both Indian and Middle Eastern cooking. Today, Black Cumin Seed Oil, (Nigella sativa), is also one of the most widely used medicinal plants worldwide. It�s a use that can arguably be traced back thousands of years to Ancient Egypt and the Pharaohs � including Tutankhamun. In Islamic literature, Black Cumin Seed is considered one of the premier forms of healing medicine. In the last few decades, Black Cumin Seed Oil has undergone numerous clinical trials and is today, widely used to promote healthy inflammatory response. Our Organic, Cold Pressed Nigella Sativa is Non-GMO and Solvent & Hexane Free. 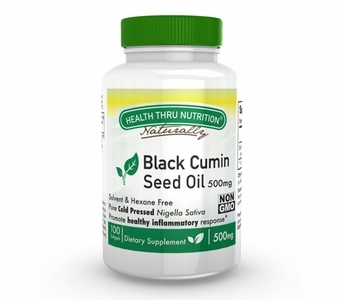 You�d be hard pressed to find a more potent and pure Black Cumin Seed Oil. Directions: Adults: Take one (1) softgel daily with food as a dietary supplement or as recommended by your healthcare professional. Before using any dietary supplement, pregnant or lactating women should consult with a physician or health professional. Keep bottle tightly closed. Store in a cool, dry place at controlled room temperature 15�C-30�C (59�F-86�F). Do not refrigerate.